Book News: Michael Vick Cancels Book Tour Because Of Threats : The Two-Way Also: Maurice Sendak's watercolors; the longlist for the Women's Prize for Fiction is announced; and complaints against Bob Woodward's book on John Belushi. Michael Vick of the Philadelphia Eagles on the sidelines during a game against the Arizona Cardinals. 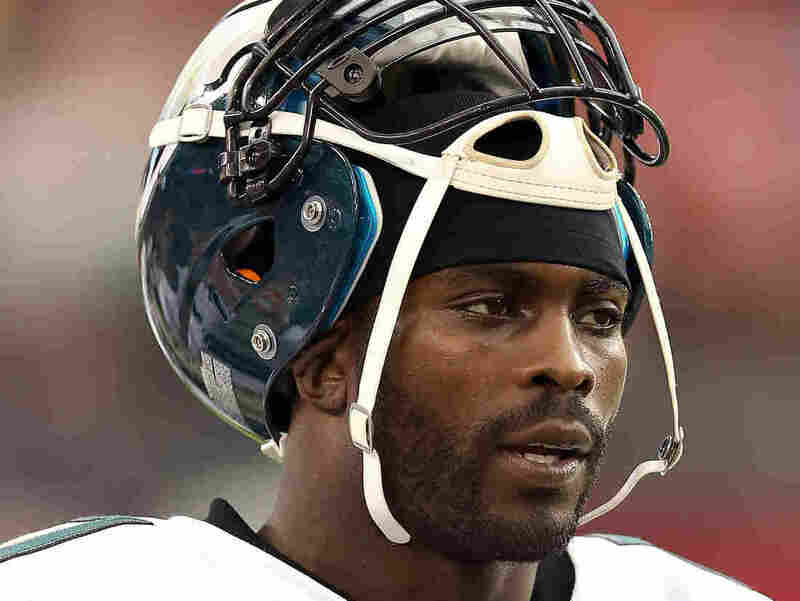 Philadelphia Eagles quarterback Michael Vick has cancelled the book tour for his autobiography, Finally Free, after "protests escalated into threats of violence," his publisher told CNN. Vick's past connections to an interstate dogfighting ring — he was convicted in 2007 and spent a year and a half in federal prison — didn't win him many friends. The New Yorker's Avi Steinberg writes about Maurice Sendak's use of watercolors in My Brother's Book: "The effect is of looking deep into a microscope and entering the dramas of an animal cell, the pulsing textures and musical logic, the way each tiny organelle busily plays its part in sustaining the general tremble of the thing." The longlist for the 2013 Women's Prize for Fiction (formerly the Orange Prize) was announced Wednesday, and includes Hilary Mantel, Zadie Smith, Maria Semple and Barbara Kingsolver. Gwyneth Paltrow, the Hollywood actress, subpar rapper and host of a lifestyle website called GOOP, where you can buy an "extra large nest bowl in wasabi" for $444, has become the target of ridicule because of her new cookbook. It's All Good (which could be more accurately titled, It's All Good (Except For Gluten, Eggs, Dairy, Shellfish, Sugar, Coffee, Alcohol and Meat) was dinged by the The New York Post as "a recipe for ridicule", and The Atlantic Wire called it the "Bible of Laughable Hollywood Neuroticism." For Slate, Tanner Colby re-interviews the sources for Bob Woodward's Wired: The Short Life and Fast Times of John Belushi, and finds Woodward's portrayal wanting: "There's never a smoking gun like an outright falsehood or a brazen ethical breach. ... But getting the scoop is only part of the equation. Once you have the facts, you have to present those facts in context and in proportion to other facts in order to accurately reflect reality. It's here that Woodward fails." After the annual VIDA Women in Literary Arts survey came up with dismal numbers on gender equality in literary publications in 2012, Flavorwire asked the two publications that actually did well in the measure — Granta and Tin House — how they did it. Best answer goes to Granta's John Freeman: "Granta has no secret for how we maintain these percentages. I don't force myself to think of Louise Erdrich, or Karen Russell. Or some of the writers who are on our upcoming Best of Young British Novelists issue. In fact, it is hard for me not to; to me, they are simply the best out there."